When the documentary This Changes Everything premiered at the Toronto Film Festival earlier this year, its powerful messages of environmental justice and climate action made headlines across Canada and around the world. 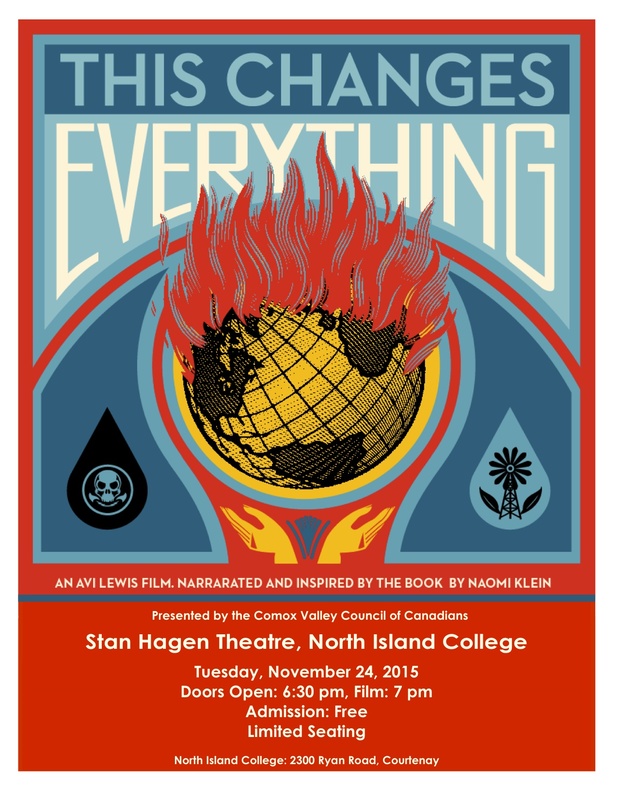 Now This Changes Everything will make its Comox Valley debut on Tues. Nov. 24 – 7 pm at the Stan Hagen Theatre, Courtenay – presented by the Comox Valley Council of Canadians. The film’s cross-country release has been timed to refresh the conversation and provoke dialogue as global political leaders prepare for the next and most critical round of United Nations’ negotiations on climate change. Directed by Canadian filmmaker Avi Lewis and inspired by Naomi Klein’s award-winning international bestseller This Changes Everything – the film is a potent call to action. Interwoven with stories of frontline communities is Klein’s most controversial, hopeful and inspiring idea: that we can seize the crisis of climate change to transform a failing economic system that benefits only a few, into one that’s sustainable for all peoples and the planet. Filmed in nine countries over four years, This Changes Everything presents seven powerful portraits ranging from the Alberta Tar Sands to coal mine resistance in India and Beijing, to grandmothers in Greece protesting the arrival of a Canadian gold-processing complex. With Klein serving as narrator and guide, the film connects carbon pollution in the atmosphere with the economic system that put it there, uncovering the ravages of unchecked capitalist “extractivism” and the grassroots initiatives that very bravely combat it. Resistance and opposition transform into empowerment and solutions as citizens have a profound — even revolutionary — impact on their society. Join the Council of Canadians at Courtenay’s Stan Hagen Theatre, North Island College, on Tues. Nov. 24. Doors open 6:30pm, film begins at 7 pm. Seating is limited– admission is FREE. Donations will be collected on behalf of World Community and Raven Trust – No Site C Dam Defense.